Mercy Songs. Kai Carlson-Wee and Anders Carlson-Wee. Diode Editions, 2016. 31 pgs. $12.00. 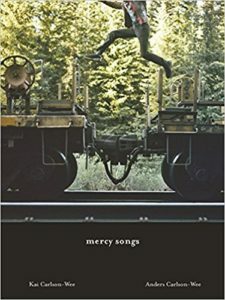 Mercy Songs is an unusual collaboration between brothers, Kai and Anders Carlson-Wee. The twenty-two poems alternate between the two authors—so it is the collection rather than the poems themselves that is collaborative—but thematically, imagistically, and even stylistically, the poems are closely linked. Many of the poems are composed in comparatively long lines arranged into a single extended stanza. The language is accessible yet sonically attractive. They are set on and around freight trains and railroad tracks, with the first-person speakers not exactly plural but often speaking of (if not as) “we” and poems written by each author referring to “my brother.” The concept and strategy of this chapbook is therefore (I think) unique, but its success depends on what every other collection depends on—the quality of the poems themselves. and slept in the mouths of caves. We don’t absolutely know the setting for the poem until this last sentence, and it is here that readers understand why mercy songs might be so necessary. The speaker experiences this rare moment of privacy as he listens to the night noises while everyone else sleeps. The night is so peaceful that it almost feels free: “the whole penitentiary seemed / to be floating.” The references to lions and dragons and pirates make it seem almost magical until we remember that no, it’s a prison. 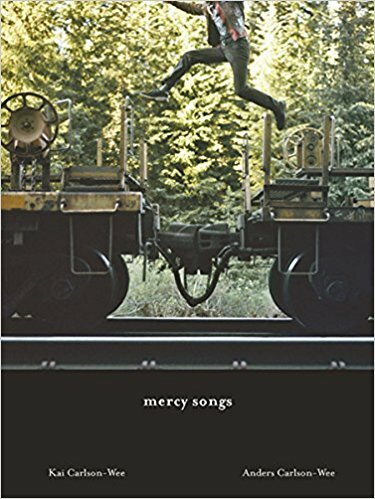 Many of the poems in Mercy Songs function this way, surrounding the harsh reality they describe with the pleasurable music of language. The Neanderthals tracked mammoths through the snow. Our resemblance to Neanderthals doesn’t depend on their hypothetical ability to use language. Rather, our language does not solve our inability to communicate, even with someone as close as a brother. The middle third of the poem describes the speaker and his brother attempting to build a shelter. Then it returns to a consideration of Neanderthal anatomy, which suggests that it’s possible they did speak. We can’t know now, but perhaps soon we will: “When scientists / finish a life-size model of the esophagus, we’ll finally hear / what their voices must have sounded like.” This poem is thematically complex. It is skillfully crafted, like every other poem in the collection, which is a good thing because these writers have something to say. Kai and Anders Carlson-Wee have mastered many of the strategies of poetic craft. For that reason, their work appeals to me as a poet. And the poems themselves are remarkably compassionate. For that reason, they appeal to me as a human being. This entry was posted in A Review A Week on January 13, 2018 by Lynn Domina.